At last week's football game, Jorre McMahan was honored with the release of a version of his jersey. Mr. McMahan passed away last week while coaching in Hampton, Arkansas. Below the video are a few words from one of his classmates. When I think of what it means to be a Miner, the obvious characteristics come to mind: have pride in what you do, keep your dreams close to your heart, and follow those dreams. Going to school at Bauxite, graduating from Bauxite always felt like I was a part of a family, and right now that family is hurting. I only went to school with Jorre McMahan for 2 years. His junior and senior year were my 7th and 8th grade year. I think it speaks volumes about him when I say that Jorre made an impact on my life back then. He was and is what I think the definition of being a Bauxite Miner truly is. He always had pride in what he did, and it looks to me like he kept his dreams close to his heart and followed them. I always knew he was going to do great things. It's players like Jorre that make me excited to go to Bauxite football games. Nothing ever got him down. He exemplified school spirit, and his personality made his school spirit contagious. I know you may have never gotten the chance to meet this great guy, but he touched the lives of thousands of Bauxite students both when he was in school at Bauxite and also after he graduated. 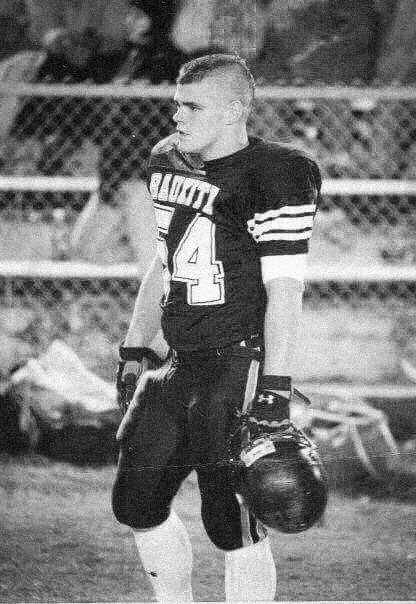 He was the football player that little kids dreamed about being...He was Bauxite. He was THE Miner...I just wanted to make sure that I said something in case no one has yet. Because I, for one, want people to remember him like I remember him. Which was in his football jersey, geared up to play or just paired with jeans to wear to class on a Friday; always paired with his signature Mohawk, and if it was during school, he always got the spirit stick after the pep rally. Jorre McMahan was a Miner, Jorre McMahan is the Miner Spirit. May he Rest In Peace.